Speed-Eater is an unlockable minigame in Yoshi's Island DS. 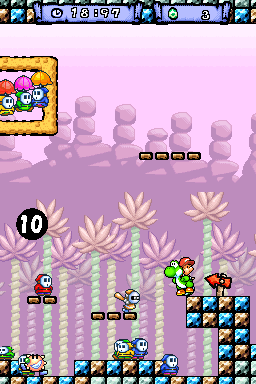 The player controls a Yoshi in a long room full of enemies and must try to make as many eggs as they can by eating enemies. A Hard Mode can be unlocked by collecting all eight Character Coins in World 4. Players have thirty seconds to eat and make eggs out of Shy Guys and a few harder enemies. This mode has many more difficult enemies, some of which can't be eaten, however the player is given sixty seconds to beat this challenge. This page was last edited on April 8, 2018, at 21:40.